Welcome.. All Guests will be.. Durable with Jedi approved rubber backing.. Welcome, all guests will be when you place this Yoda welcome doormat by the front door. 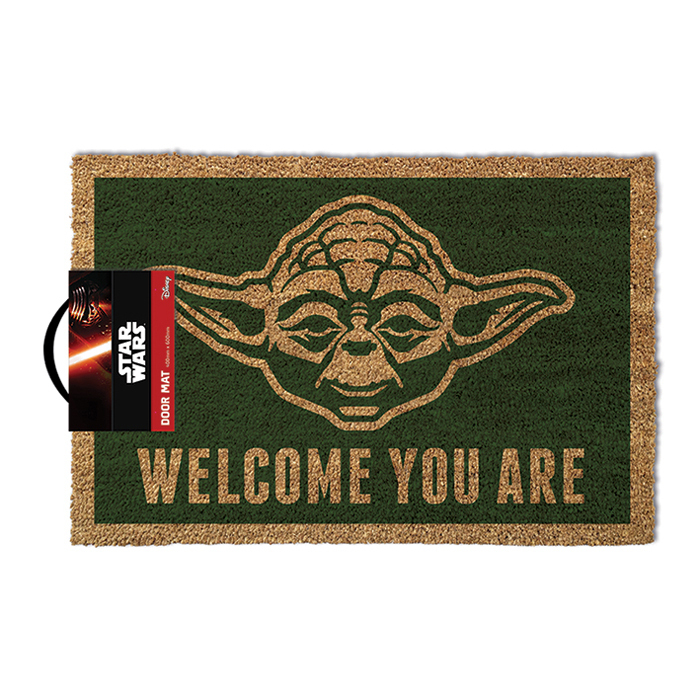 This cool 400mm x 600mm door mat displays Yoda's likeness over a short welcome message that all guests (especially Star Wars fans) will enjoy. The Star Wars Yoda Welcome You Are Door Mat is the coolest house warming gift, Christmas gift, birthday gift or simply geeky gift for any fan of the iconic Star Wars brand. Manufactured with Jedi approved rubber backing. Repels and protects against Sith Lords. Standard Shipping: "Star Wars Yoda Welcome You Are Door Mat" is unable to be delivered at our normal fixed price of $9.95 because of it's size and/or weight. There will be a small surcharge for freight on the checkout and free shipping will not be applied. Express Shipping: "Star Wars Yoda Welcome You Are Door Mat" is unable to be express delivered at our normal fixed price of $14.95 because of it's size and/or weight.. If you need this item delivered fast the shipping cost will be calculated at actual cost at checkout. My 21 yr old daughter now leaves it up to her cool and trendy Mum to choose presents for all her friends as they are green with envy over the things I have bought for her. Like this door mat which was totally excellent and useful too. I may have to get one for myself.